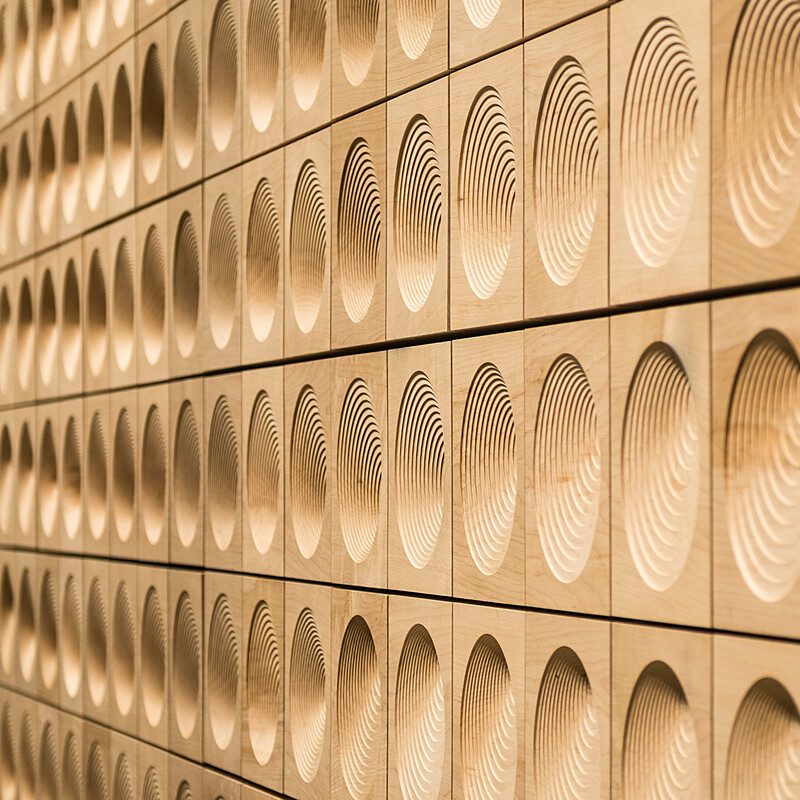 Living Wood: Tracings | Williamson Williamson Inc. The work in this exhibition explores wood’s material history by extracting artifacts from a digital exploration of the effect of mass movements in the landscape on the growth and form of trees. Trees affected by mass movements record the evidence of geomorphic disturbance in the growth-ring series. The simulation of this mass movement, in the form of a distorted digital surface, is shown as both a projection and a registration. 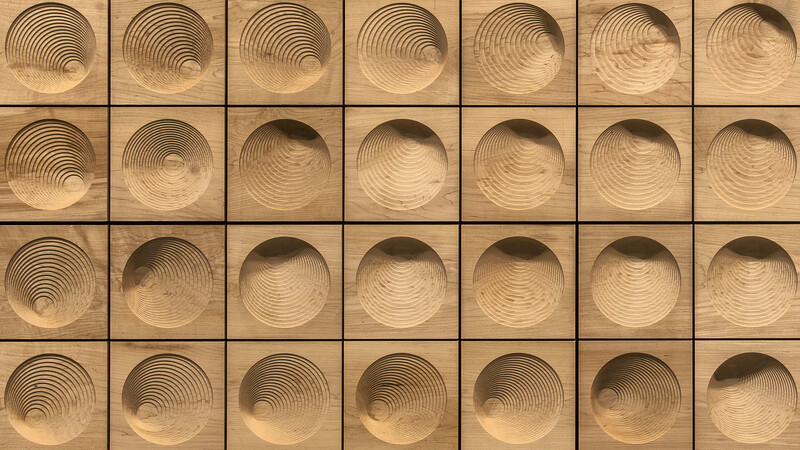 Tracings is a 200 square-foot grid made up of 288 individual squares of Ontario White Maple. 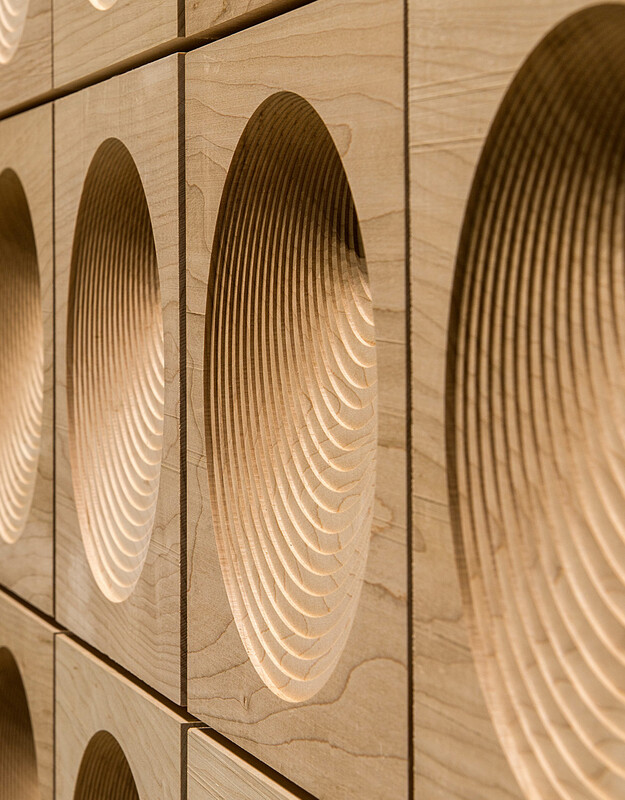 Using the modern tools of digital fabrication, each piece is carved to a depth that registers the angle of a curved surface projected onto its face. From a distance, one reads the undulating plane registered on the wood’s surface. Up close, the subtle differences between each piece become apparent. The result mimics the forest in that each piece of wood is unique, and builds to a whole greater than the sum of its parts. The Tracings series (in smaller sections from 4 to 16 blocks each) is available at the Corkin Gallery. Please call Jane Corkin for more information. The work in this exhibition explores wood’s material history by extracting artifacts from a digital exploration of the effect of mass movements in the landscape on the growth and form of trees. Trees affected by mass movements record the evidence of geomorphic disturbance in the growth-ring series. The simulation of this mass movement, in the form of a distorted digital surface, is shown as a registration.